“Then I saw the beast and the kings of the earth and their armies gathered together to wage war against the rider on the horse and his army. 20 But the beast was captured, and with it the false prophet who had performed the signs on its behalf. With these signs he had deluded those who had received the mark of the beast and worshiped its image.The two of them were thrown alive into the fiery lake of burning sulfur.21 The rest were killed with the sword coming out of the mouth of the rider on the horse, and all the birds gorged themselves on their flesh.” See also: Ezekiel 38, these nations are aligned and Persia building bases on Israel’s border just like Ezekiel foretold, the stage is being set. Destruction of the caliphate, or accept the Lord’s Invitation to his party. Bold as a Lion. Chris Queen. Please hit the Follow Key above and to the right for future updates. Please leave you valued comments in the form below. 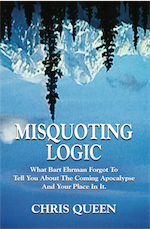 My books are available on Amazon Misquoting Calculus HERE.